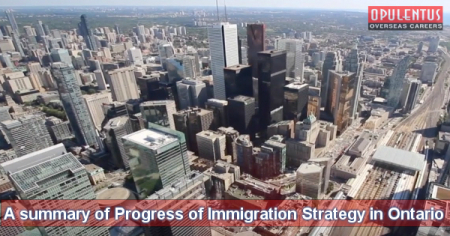 In 2012, the Government in Ontario released an immigration strategy, emphasizing three objectives. These were, drawing additionally skilled immigrants, facilitating their integration in the society, and making international connections to form a diversified and robust community. The government always releases its Annual Progress Report, featuring the achievements in the implementation of the immigration initiatives for that year. The present 2017 Report emphasizes the success achieved by the Citizenship Ministry of the province. A new Agreement regarding Canada-Ontario Immigration has finalized by covering three areas of priority in 2018. This will involve International Students immigration, Municipal immigration, and French-speaking immigrants. On January 1st, 2018 the Ontario Immigration Act was introduced after inclusive stakeholder deliberations, to provide a perfect framework for regulating all immigration programs managed by the province. Modernization of the OINP by creating targeted streams aimed to reflect the labor market needs of Ontario and changeover to adopting Online Application Process for the program. The approach of conducting Minister’s Employers Tables was adopted which a discussion involving the government and the employers located in the province. In seven instances, the government gave nine recommendations, which focused on eliminating barriers, in the selection process for immigrants, creating a Business Advisory Council, as well as improving integration of labor and the market. There was a steady increase in the allocation meant for OINP nominees. In 2013 there were 1,300 nominees which increased to 5,500 in 2016 and touched 6,000 in 2017. Processing of applications in OINP, (except for Entrepreneur and Corporate stream applications), is done within 60 days after receiving the form. The Online program provides Municipal Immigration Information and supports 32 local immigration portals. The aim is helping immigrants at pre-arrival stage itself to prepare them to move to a particular locality in advance. Ontario had 625,000 Francophone citizens in the 2016 Census, and has a sizeable Francophone community, outside Quebec, in Canada. There is a focus to increase immigration of French-speaking professionals into the province. An exclusive French-Speaking Skilled Workers stream exists under OINP. It is a fact that an increase of 1% in ethnocultural diversity leads to a rise of 2.4% in the revenue and 0.5% in productivity. Hence Ontario extended help to 5900 skilled immigrants to access bridge training projects and also helped 4,400 of these immigrants to find jobs in their domain.